When you are camping in winters, surely you need tents that are built to withstand winter conditions. They are specially designed to provide you comfort while you are camping in winters. There are several types of winter tents available in the military surplus stores, but not all of them are created equal. They should be large enough to relax in, durable enough to sleep in and warm enough to make you feel pleasant. Besides, there are several other factors that need your consideration when selecting the best winter camping tent. Here is a list of few of them. The double walls of these tents will protect you from outside temperature and provide warmth. Usually larger and heavier tents with two-wall system work better in such cold climatic conditions. Even single wall tents can be used in cold weather provided you have got superior insulated gears like clothing, sleeping pad and sleeping bag. 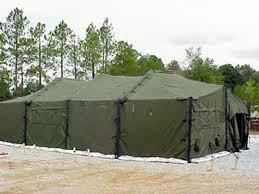 Single wall army tents are comparatively smaller in square footage and lighter in weight. When you are camping in the cold with your friends, it is best to sleep together instead of staying in individual tents. Being alone in such harsh environments increases the chance of death of the person. Staying together means no one will be lost. 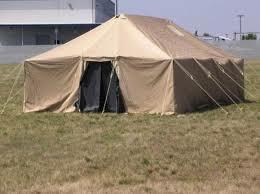 In addition, if there will be more people in the tent, there will be more heat produced by the body. 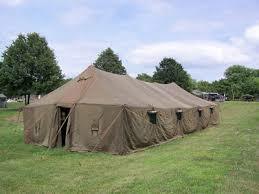 Most of the army tents are designed to hold up to 4 people. Every camper wants to have a comfortably sized shelter because this is the place where you will be spending majority of your free time! If you have a big room you can enjoy some indoor activities with your friends like playing cards. The quality of the tent should be good enough to withstand blizzards and high winds. Some things that you should really look for are aluminum poles, tough doors and strong stakes.